The Midnight Mailman and Big Scary Monster sit accross from each other in the backyard. There is a silence both awkward and amicable. 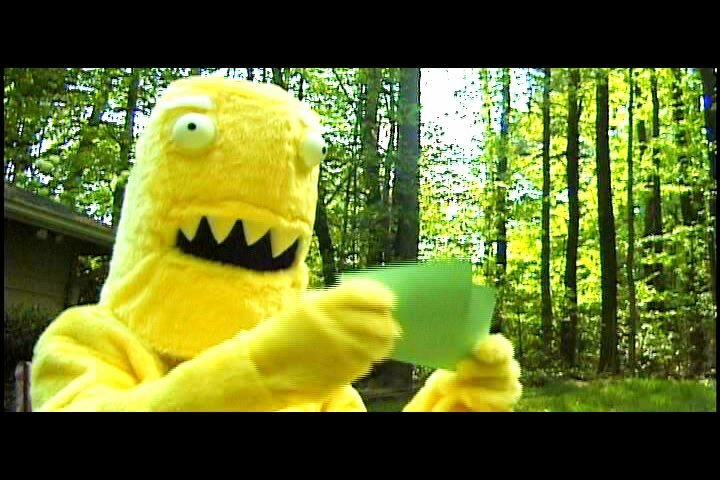 The Monster holds up a stack of index cards, shuffles through them, and puts them back down on his lap. "I thought you were going to ask me some questions," says The Midnight Mailman. The Monster looks the other way and scratches his armpit. The Midnight Mailman watches a wasp fly around the camera lens. The Monster tries to catch it, but fails. Shuffles through the cards a few more times, drops one, but doesn't seem to care. "Do you want me to tell you about myself?" asks The Midnight Mailman. The Monster picks at his teeth. After a moment he inspects his yellow tooth-picking finger before wiping it on his chest. "I've been doing the show for a little while now... people seem to like it." says The Midnght Mailman. "I enjoy doing it." The Monster hears a noise behind him and turns quickly around. He drops the remaining question cards, stands up, knocks over his chair, and walks away.